This entry was posted on January 17, 2013 by Lightning Labels. Sticker labels can do their part in conserving the environment, too. Several western state wildlife agencies recently launched a joint sticker campaign to stop the spreading of invasive species. The particular species in question is the quagga mussel, which Arizona, California and Nevada have partnered together to stop. The sticker campaign is being used to educate recreational boaters on the correct equipment cleaning needed to stop the spread of the mussels. The sticker calls for boaters to "clean, drain and dry" their boats after each use, as well as decontaminate affected areas and inspect each aspect of the boat. Custom Stickers Also Used For Compliance The Nevada Department of Wildlife also announced it requires boaters to purchase and affix aquatic invasive species (AIS) custom stickers to their watercrafts. Prices range from $10 for in-state motorboats to $20 for out-of-state boats, all proceeds will go to fund research aimed at stopping the spread of invasive water-borne species. The quagga mussel has routinely been identified as a priority species to stop. 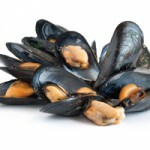 Native to Ukraine, the U.S. Department of Agriculture classifies the quagga mussel as invasive because of its extremely negative impact on plankton levels and the fact it takes in excessive amounts of pollutants that harm wildlife that eat the mussels.